Contractor. Remodeling. Kitchen, Bathroom, Exterior: Additions, and Painting. Seattle, Washington. 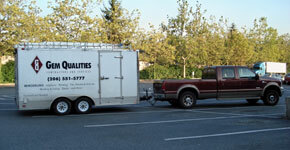 Gem Qualities has served the residential remodeling needs of Seattle since the mid 1990’s. Remodeling a home is a significant investment. It has been our privilege to help hundreds of homeowners realize their dream of a beautifully remodeled home to fit their lifestyle and the architectural integrity of their home. A remodel of a kitchen, bathroom or an addition of a room not only improves the enjoyment and usefulness of your home, it can also add to its value if it’s time to sell or refinance. Whatever your goal, be it curb appeal or adding modern comforts and conveniences, Gem Qualities has the experience to get the job done right, with proper planning, quality workmanship and accountable project management. At Gem Qualities, we create appropriate and affordable design solutions. We invite you to visit our Showcase of finished projects for inspiration or Contact Us for a free consultation. Our office hours are Monday-Friday 9:00am to 5:00pm.